I have always loved the color combination of white and creamy beige. I love it in outfits and in décor too. I think it is instantly elegantly chic and timeless. There is just something so feminine, relaxing and perfect about the color combo. How crazy cute are these? 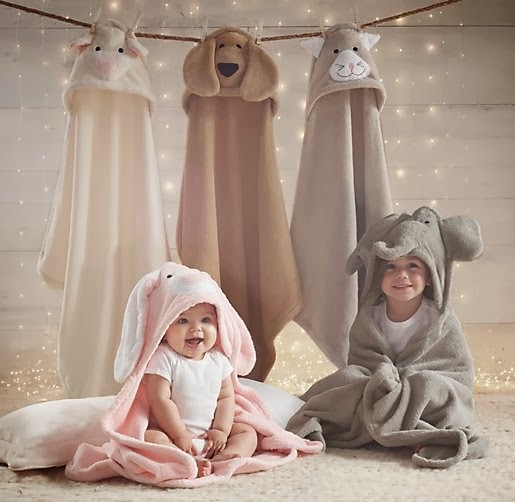 Don't you just want to pick up these cuties and give them hugs? 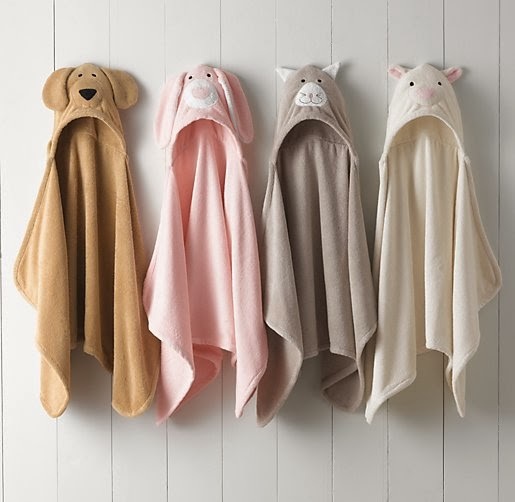 The big floppy ears on the pink bunny hooded towel are insanely adorable. 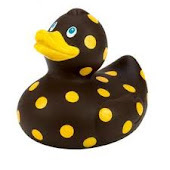 Would be so cute for Easter. I can't decide which is the cutest. 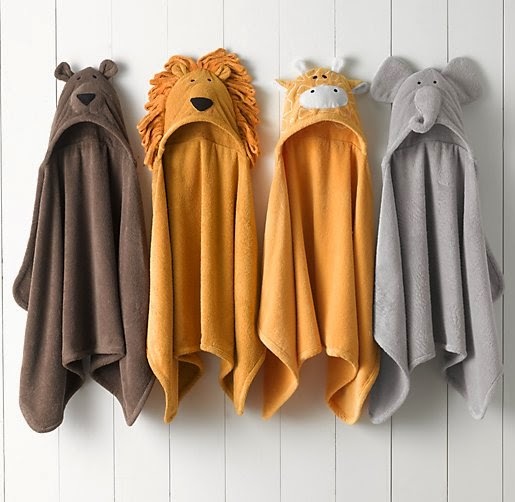 The lion is uber sweet too, but then who can resist the giraffe or bear or little white mouse? I'd have to get one of each I think! Love em? You can find them here. The sun is beating in through the windows today. It feels so good. It feels like a hot summer day, like you could slip on a pair of shorts, step outside and go eat fudgesicles sitting on the curb. I can't wait for summer. This sunshine just puts me in such a happy mood. This is my kind of all white washroom. It's not too stark and feels fresh and inviting. 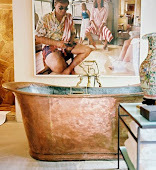 Only change I'd make for my tastes, is to change the tub surround. 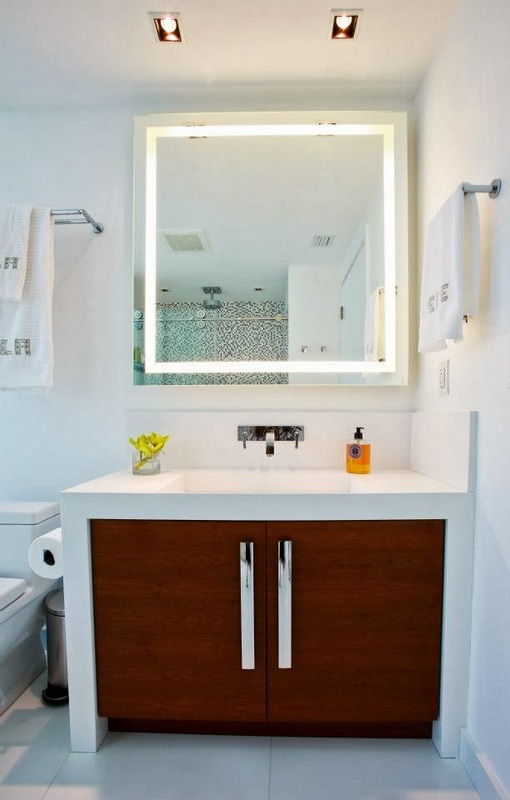 Instead of white wood panels I'd rather have one large white glossy panel similar to the doors on the vanity. Something with a bit of shine. And of course, I am loving the counter to ceiling mirror. 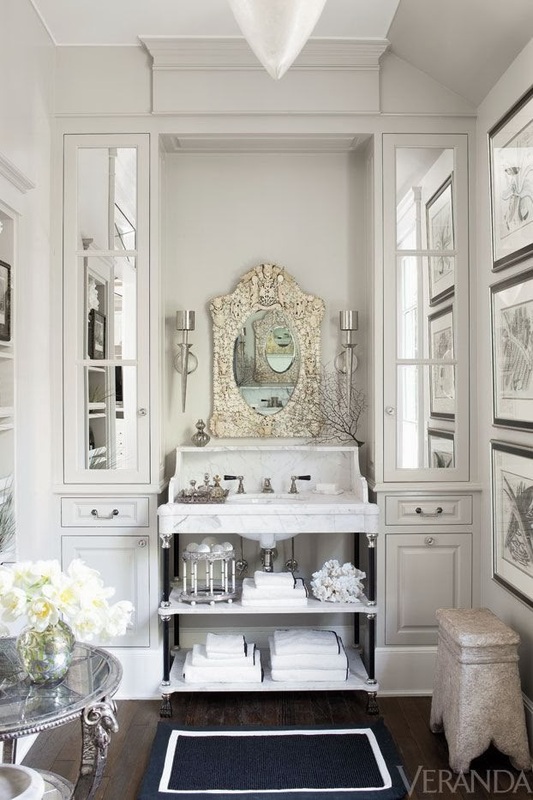 I like how the mirror spans not just the vanity, but the entire wall. 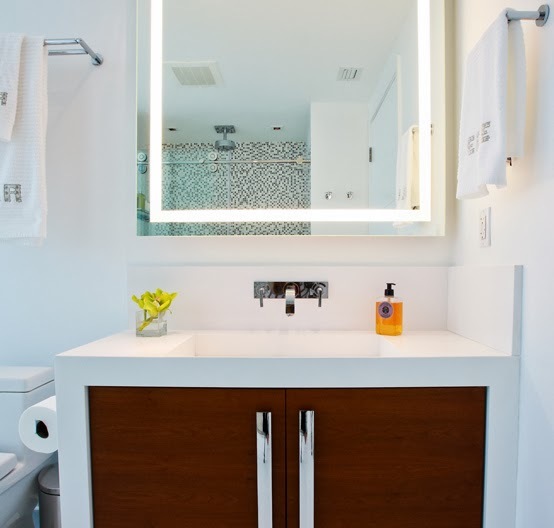 A nice touch is how they extended the vanity countertop and added the little marble shelving above the tub to store towels. 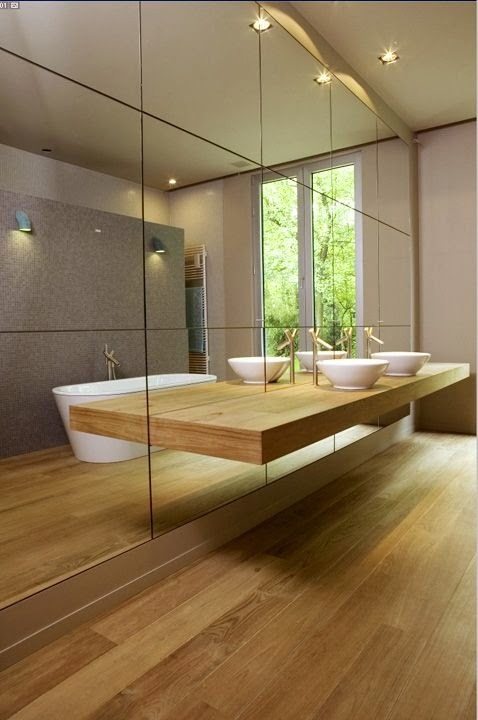 Extending the countertop so the mirror is all one level was a fantastic idea. It adds a nice little detail. 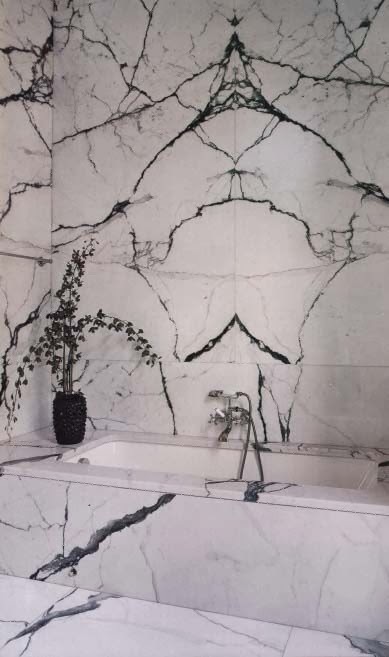 Notice, that it looks like they lined the back wall of the shelf in marble too, it makes it look that much more luxurious and it's such a small space, so it really wouldn't cost much. 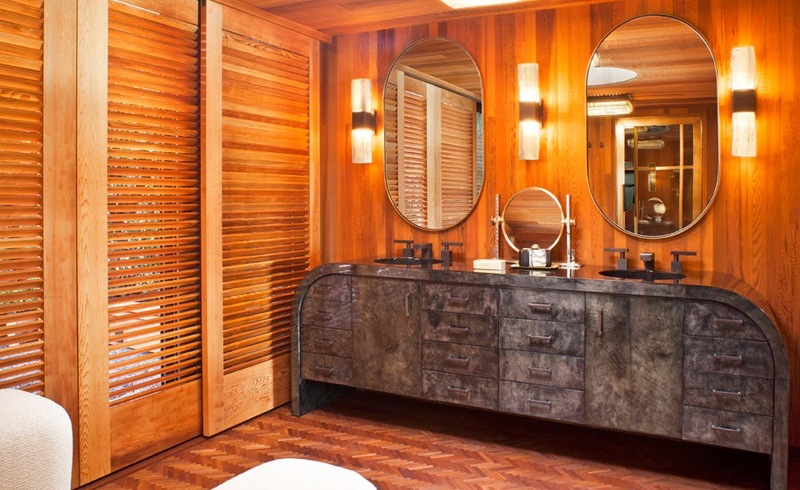 Gorgeous floor to ceiling mirrors behind the bathroom vanity. Which looks better? 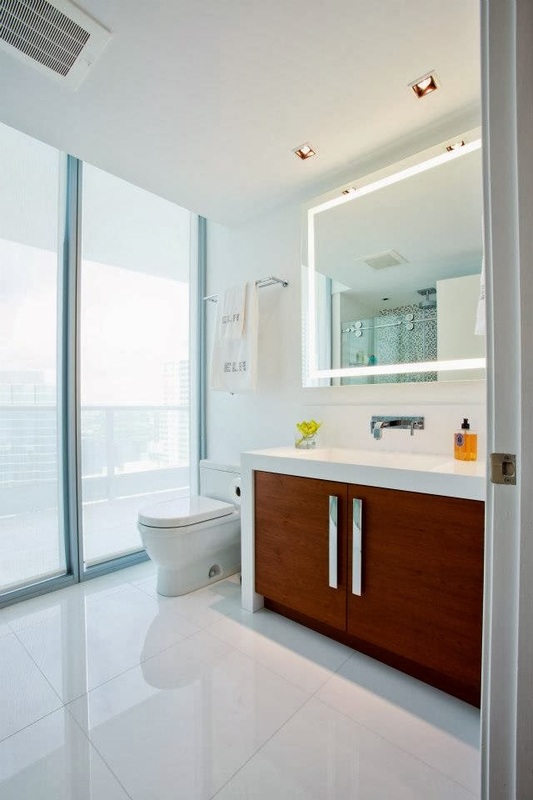 Floor to ceiling mirrors or individual vanity mirrors? Think I'd only be closing these shutters if there was a hurricane. That view is just gorgeous. 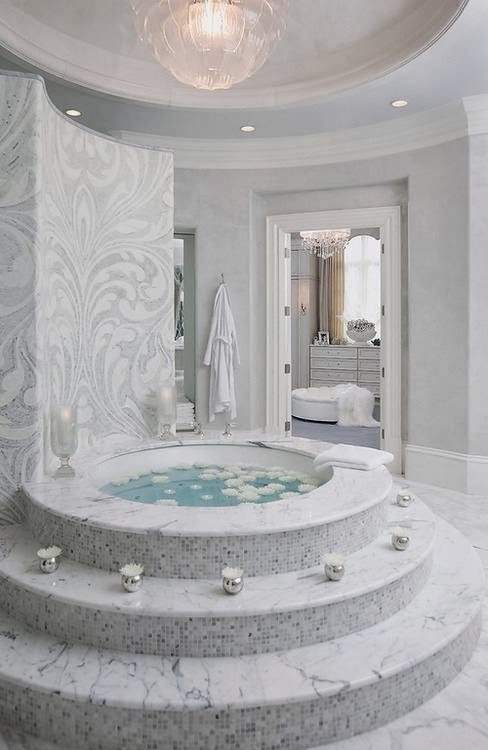 I love the look of this bathroom for a young family or newly weds. It's super bright and friendly and very functional. The color combination is subtle and there is a wonderful use of textures and shine to really give this bathroom character. 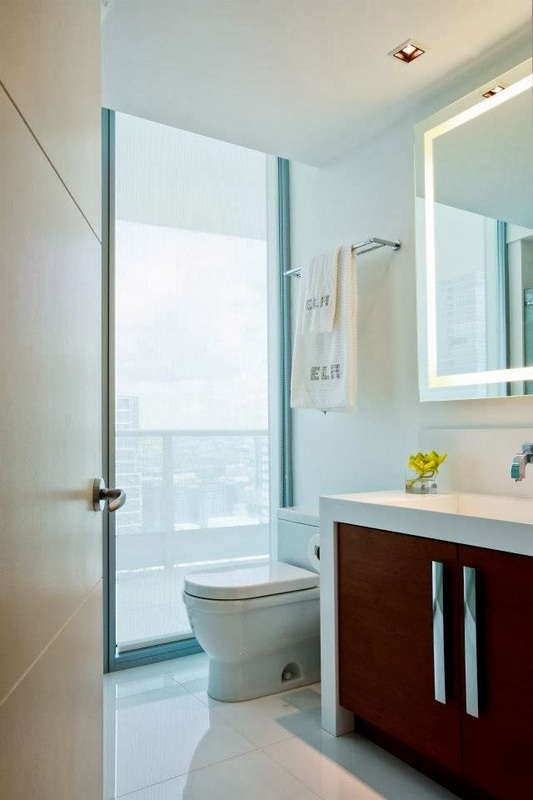 Plus, this bathroom looks squeaky clean. 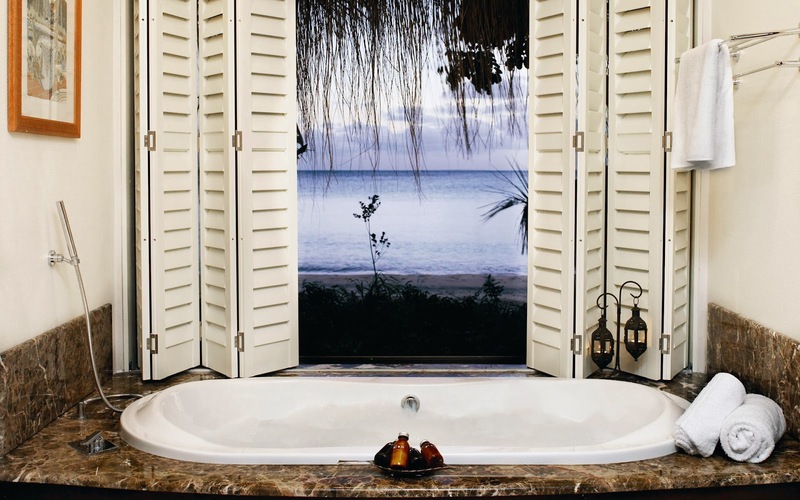 Exactly how you want a bathroom to look and feel. Walking in here in the morning would be a great start to the day, with everything so fresh, clean and tidy. It would put you in the right mindset for the day. 'wake up and jump start the morning feel'. First, there's the use of clean white. 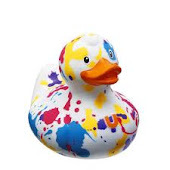 PAINT: They used a nice bright white paint color. Notice that the same color was used on both the walls and ceiling which helps to make the walls feel taller and the room larger. TILE: 24 x 24 square, high gloss white floor tiles. 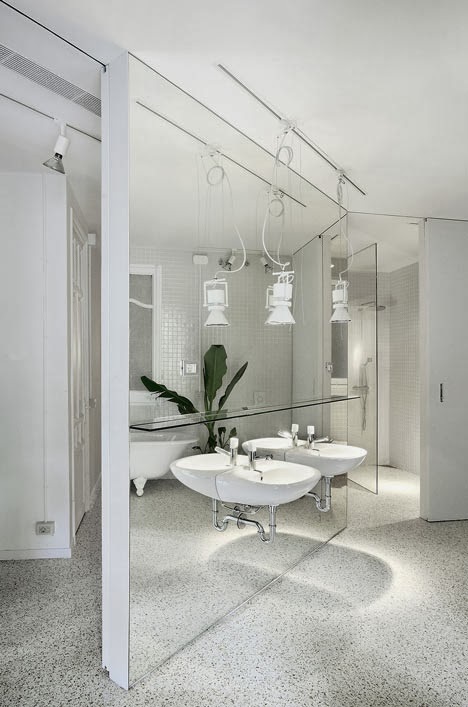 These large tiles and minimal grout lines make the floor almost look like one sheet of white. The floor looks less busy and cleaner due to the fewer grout lines and the glossy sheen helps to make the room feel larger and brighter. WINDOW COVERINGS: The floor to ceiling windows bring in a lot of light, but what is key is the window treatment they chose. The thin white blinds keep the privacy but still let the sunshine in. 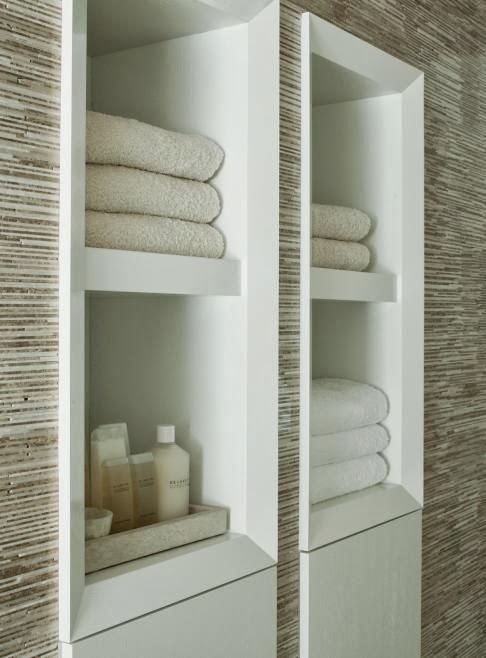 Also, there is no pattern in the blinds which helps for them to blend in with the white walls creating a seamless look and adding to the no nonsense, clean look of this bathroom. COUNTERTOP, BACKSPLASH & SINK: There's no denying that the arctic white color of this countertop helps to give a crisp clean look to this bathroom. The wide white framing around the wood doors works to brighten up the tone of the wood. If there had been no framing the wood would hang there grabbing your attention, because it is framed in high gloss white the wood looks brighter and softer, it doesn't assault the eye like a vanity that doesn't have a white frame would. The white legs balance the wood and help blend it into the rest of the space. 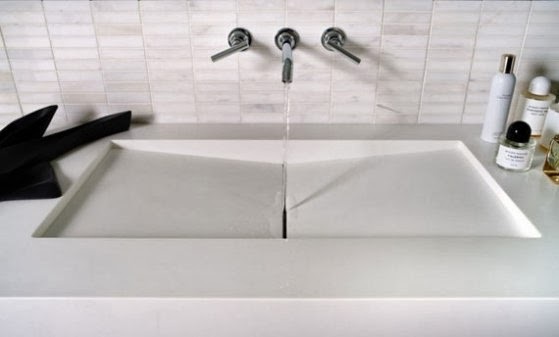 The fact that the built in sink is also white helps to create a blanket of white to relax the eye as there is no change of color between the countertop and sink. I think the 2 wall white backsplash is a key element too. 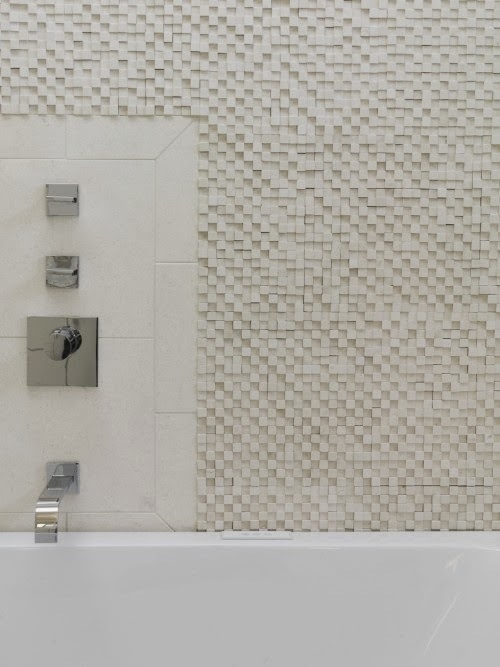 A lot of people would have instead made the backsplash out of the same square mosaic tiles that are in the shower in order to unify the two areas. I really like that the designers didn't do that here. 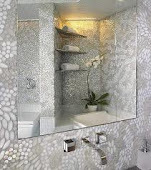 If they had used those small glass tiles on the feature wall in the shower as the backsplash it would have created a busier look and you would lose that wide open feel created by all the white elements in the room. 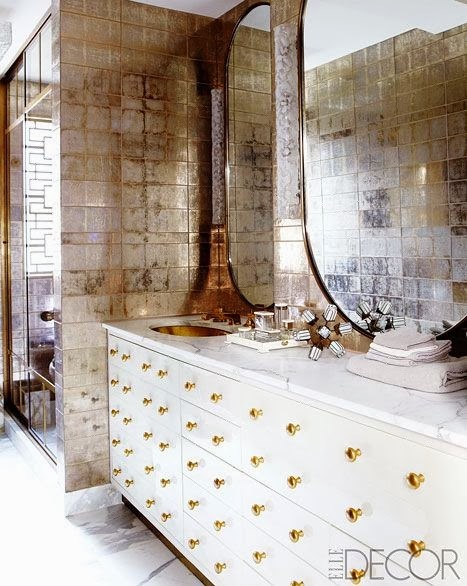 The mosaic backsplash would have instead made the wood vanity doors feel darker and the whole mood of the bathroom would feel more closed in and much, much busier. Plus, I bet it would look dated sooner then this design will. Next there's all the metal touches. VANITY HANDLES: A stand out wow design element in this bathroom have got to be these amazing long rectangular metal handles on the vanity. Ok, you'll get finger marks on them, but they are bold and fantastic, definitely worthy of a little extra cleaning. I like how the handles have a similar style to the panel of the wall mount faucet. 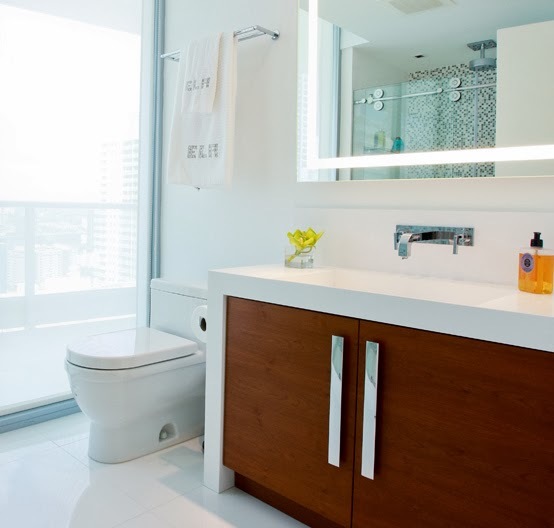 ETC...: From the towel racks to the wall mount faucet, the kinetic shower railing to the shower door handle and shower fixtures. 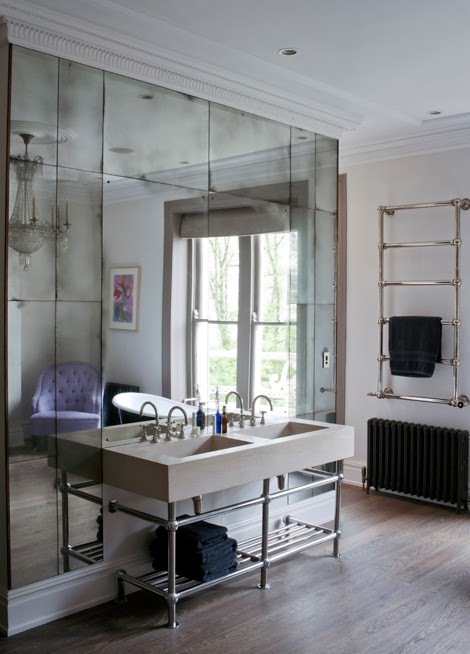 All accessories are simple, sleek chrome which adds nice reflective surfaces and clean lines. This bathroom is well lite. 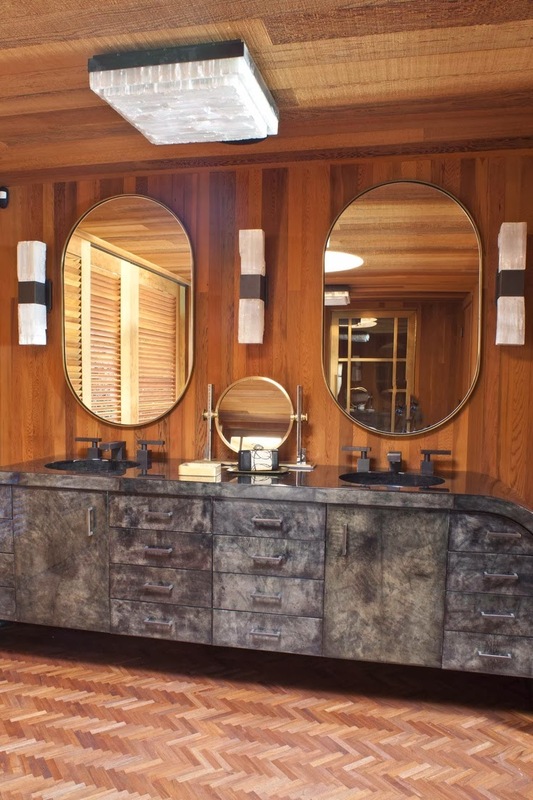 From the gorgeous natural light, to that amazing mirror to the ceiling lighting, there is no way you're going to have any qualms about putting on your makeup in this bathroom. 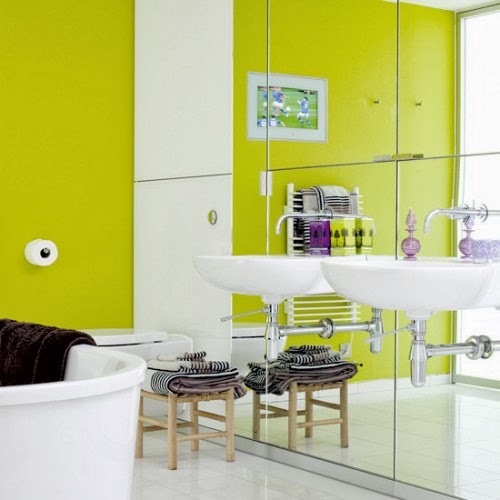 It all helps to make this bathroom feel bright and fresh. RECESSED LIGHTING BOXES: Mirrored light boxes. 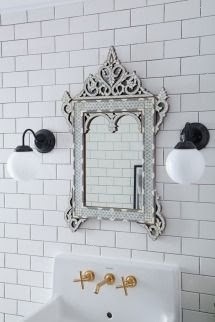 I love this style, they have similar lighting to this in the changing rooms at Zara, they light up the mirror wonderfully and add a chic little touch. BUILT IN LIGHTING IN MIRROR: We are seeing more and more versions of these amazing lite mirrors. They are a fresh modern take on those bulb makeup mirrors. I am happy to see they are becoming available in larger sizes and that they are getting more and more affordable. I love the look of this one. 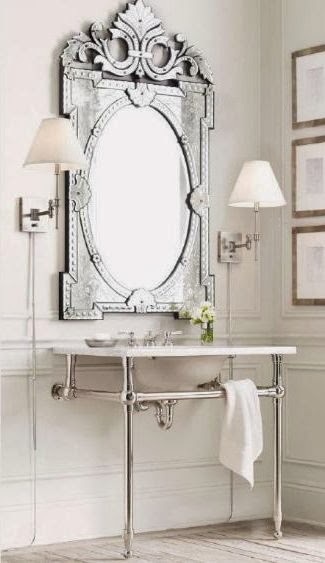 It's the perfect size for this vanity. SHOWER LIGHTING: Adding some ceiling lights to the shower is a great trick. It's especially important to do in smaller bathrooms where the shower eats up a lot of the floor space. 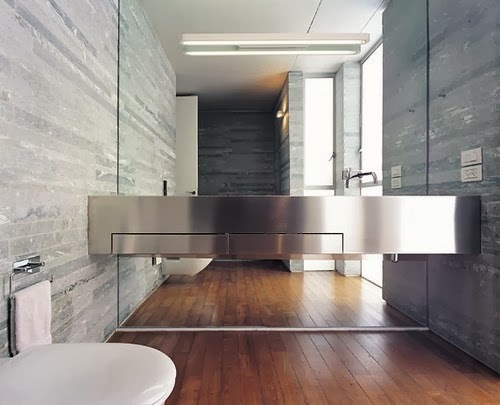 Having lighting in the shower can really help to brighten up a small to medium size bathroom. 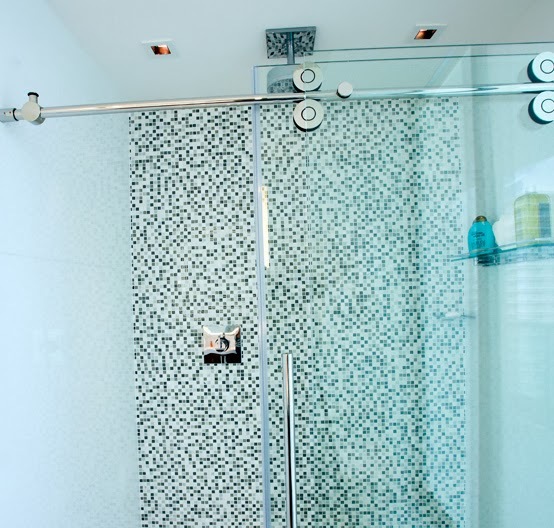 The shower tile design also has a big impact on the brightness & fresh feel of this bathroom. See how they only used the mosaic tile on the feature wall and tiled the 2 side walls in the same large white tiles as the floor? 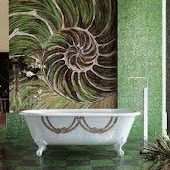 It saves you a lot of money on mosaics and less grout lines to scrub! 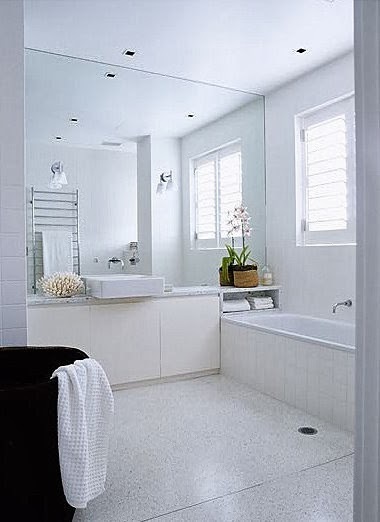 The white tiled side walls make the bathroom feel bigger. 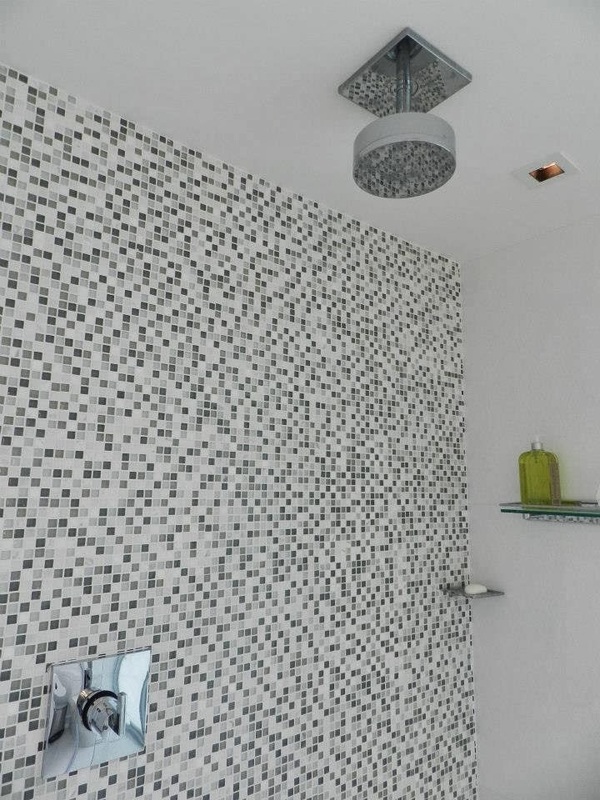 Imagine if they had tiled the entire shower in those square mosaics, the shower would feel shrunken in and the shower would stand out like a big tiled box. Instead you have a pretty feature wall. 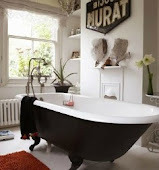 Plus they choose a pattern that has some white tiles and used white grout, this also helps to keep the look light. I've been raving about this bathroom, but I do have 3 little pet peeves about this shower. First, there's the diamond pattern floor tiles. I'm not a fan of the diamond layout for a contemporary bathroom design like this. The pattern looks dated and doesn't match with the rest of the feel of this bathroom. Maybe it's the photo lighting but the tiles also look more of a creamy color. I'm not a fan of the floor tile choice. 2nd, a long rectangular invisible drain would have really looked spectacular in this shower instead of this standard round drain. However I do like the placement of the drain (I'm guessing that maybe there was a tub here before and they saved some $ by not moving around the plumbing which is a good idea). The invisible drains are pretty pricey so I can see why they would stick with a standard round one though. I just think it would have been a nice design element. Finally, I've said this dozens of times in posts, but I'll say it again, gotta have a handshower! Ugg, cleaning this shower with only a rainshower head, and one that's not even able to pivot is going to be a real hassle. You are going to have to fill a bucket and splash the walls. This is no fun! A long thin baguette handle style handshower would have looked really nice in here and would be a huge, huge benefit. Hope these peeps have a cleaning lady. Poor cleaning lady thought. 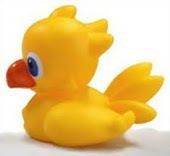 I know one cleaning lady who refuses to clean showers that don't have handshowers, she says it takes to much time and she ends up soaked. Good on her! 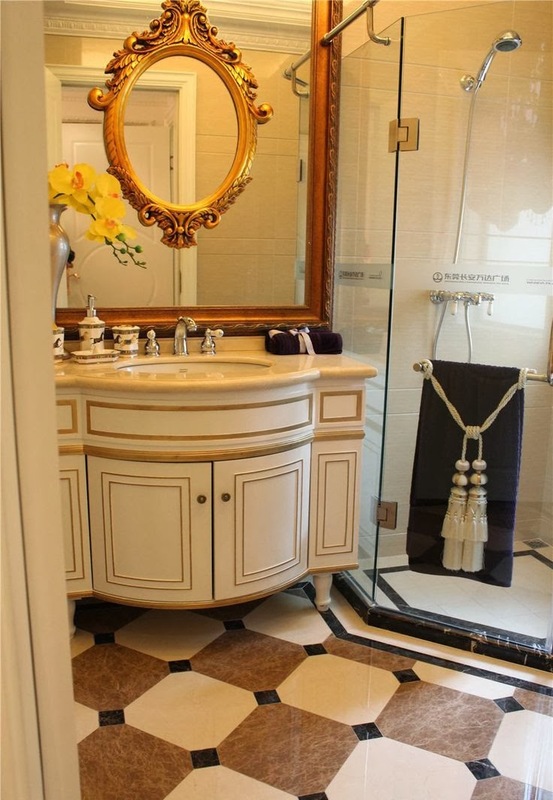 Catch the round & square theme throughout the bathroom? My favorite shower look is when round nobs are paired with rectangular panels. Here they combined round with square panels which looks really great. 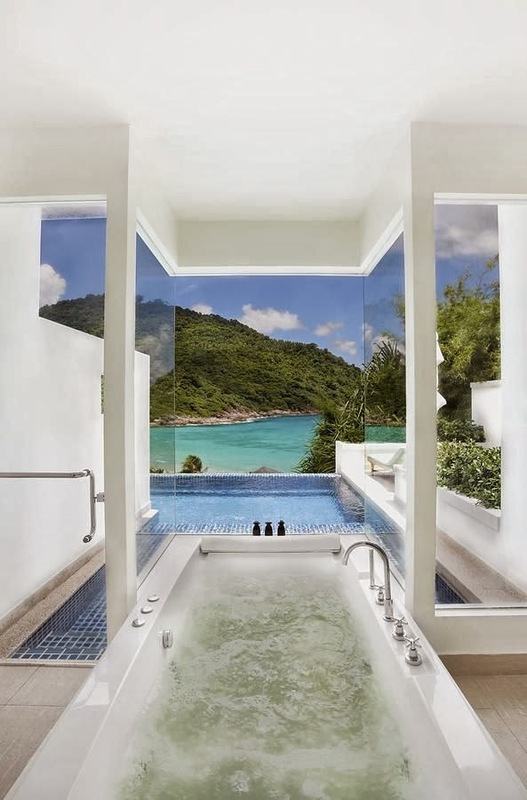 I'm glad they went with a round rainshower head, and not a square or rectangular one. 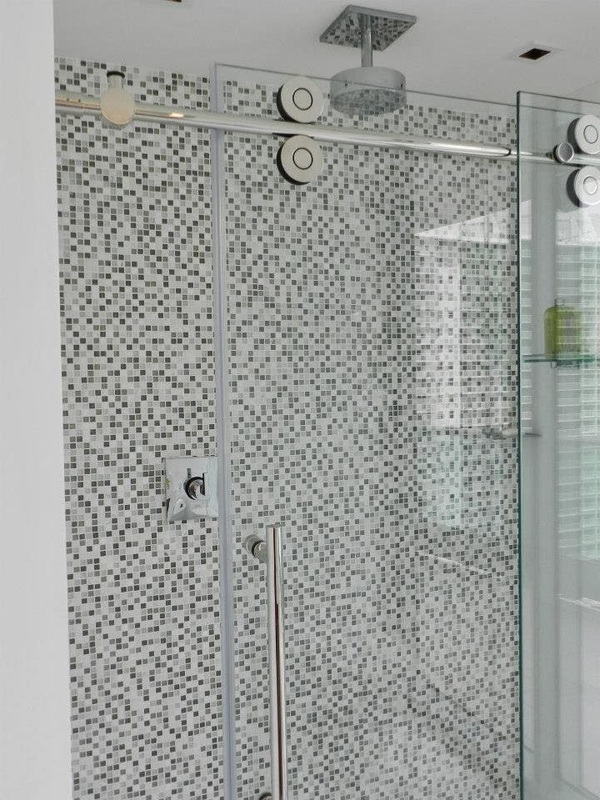 The round rainshower head looks great combined with the round wheels on the glass sliding door rail system. 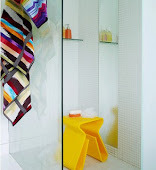 The thickness of the showerhead is also a good choice to stand out strong against the railing system. 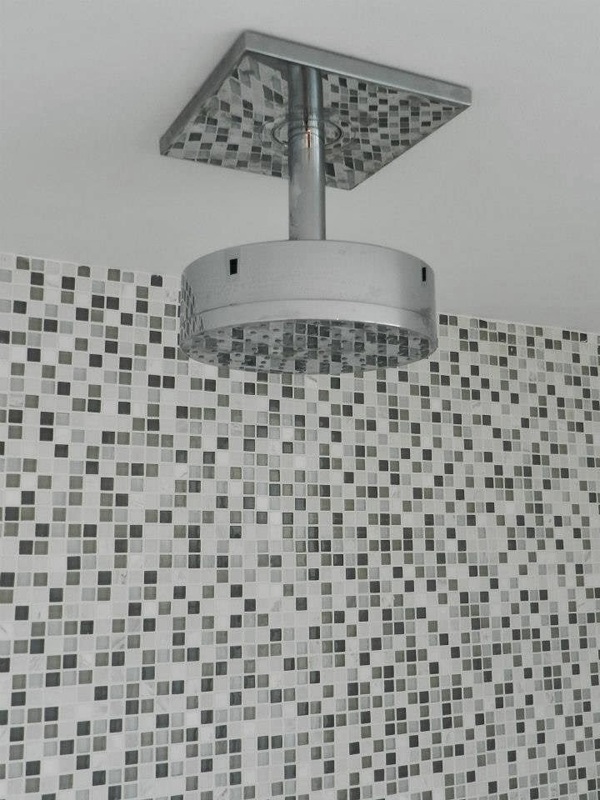 And let's not overlook the great pairing of the round rainshower head with the square panel, looks great with the square mosaic tiles. I really appreciate how consistent they were with shapes which is not always easy to do. The sink wallmount faucet is also a combination of round and rectangular design. The towel racks also have round bases, square could have worked too, but I prefer the softer look of the round circles, it helps to tie in nicely with the sink faucet design. Also, back to the vanity, glad they kept it simple and went with 2 doors instead of multiple drawers. 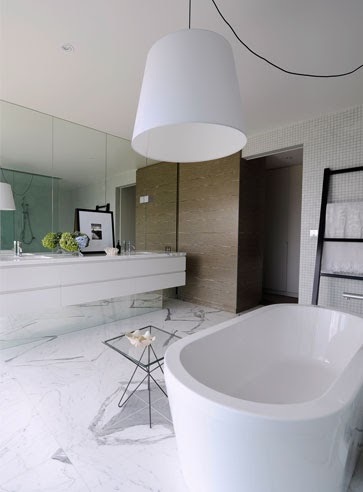 It mirrors the shape of the mirror and the square floor tiles keeping the look sleek and having minimal lines. Even the direction of the grain of the wood is perfect! I like that the grain was placed horizontally instead of vertically and is paired with vertical handles. 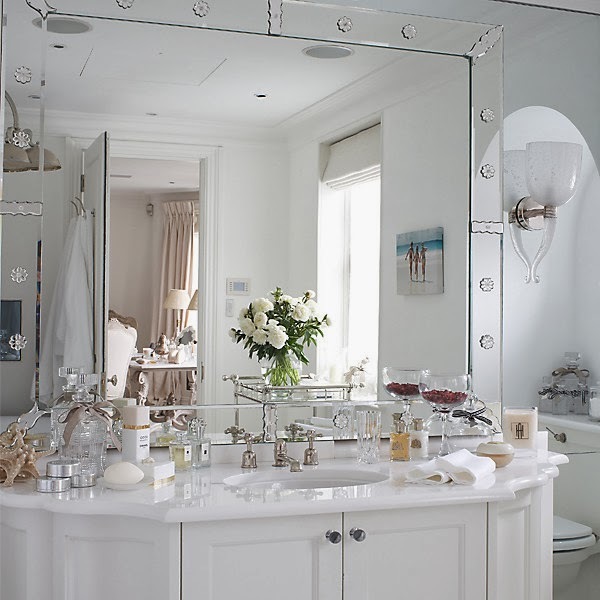 Overall, a really wonderfully designed bathroom. 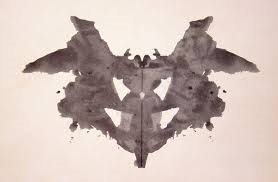 I think the key design theory here is less is often more. They really nailed it! Lately I've been all about finding the right mirror for the bathroom. I want something really spectacular. 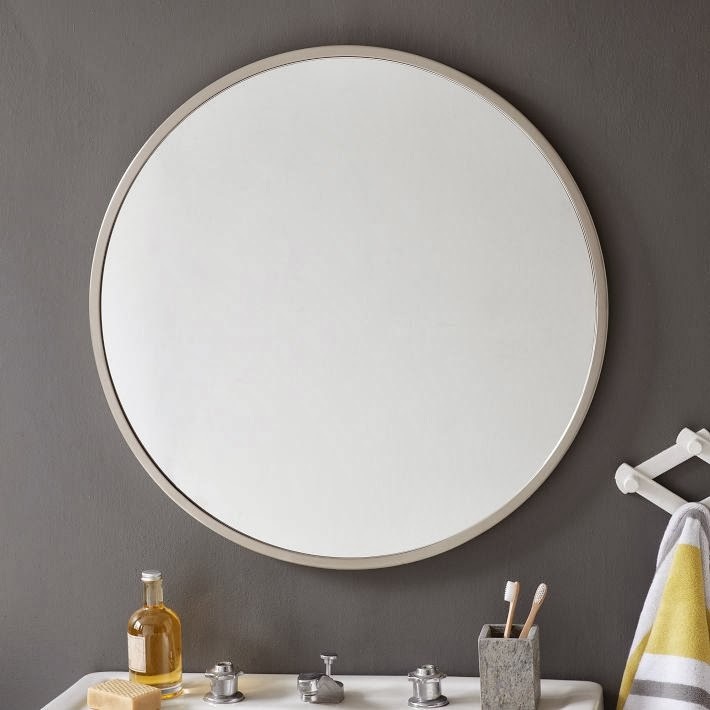 I am torn between a full wall of mirror and a gigantic round mirror. It's like when you are shopping for a new pair of specs, walking down the street you start noticing everyone wearing a pair and that's all you see. So I'm still on my mirror craze. unique mirrors do that just perfectly. Only a few days till Valentine's day! If you want to make something crafty for your loved ones, there's not much time left, but you're in luck, because these soaps can be whipped up pretty fast in just one evening. 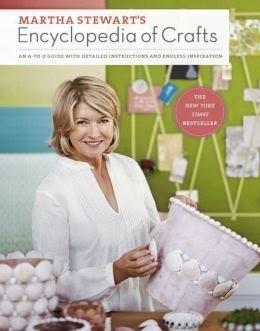 Last year I borrowed Martha's big craft book from the library, and spotted these soaps. 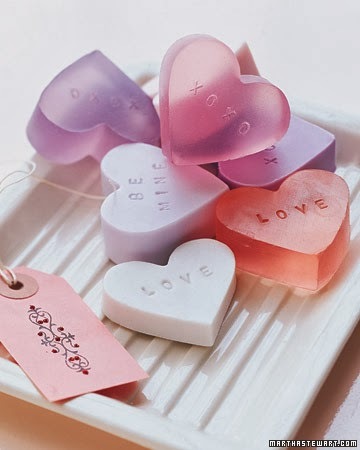 They are just adorable and perfect to add a little loving to the bathroom for Valentine's day. Flipping thru Martha's book I tore off so many little pieces of paper to put as bookmarks for all the great crafts I wanted to try. I must have bookmarked 10-20 projects, everything from pretty paper flowers to glittery birds,and you know what happened? When the book came due (after renewing it twice) I hadn't even tried one craft! Oh, I'm horrible, I've done the same on Pinterest, I've pinned tons of cool looking diys but have I tried any of them? Nooooooo! This summer I will have to try to do a little craft. how easy they are to do! If there is one look I absolutely love, it's a gorgeous wall of mirrors, not that I can't get enough of looking at myself, I just think a floor to ceiling mirrored wall looks super chic. Any time I stop in a luxe hotel or elegant office buildings, more then half the time it has a beautiful wall of mirrors. Now it's not just the mirrors that make it spectacular. They have to be combined with some gorgeous flooring. After all it's what's being reflected in the mirror that makes them so spectacular (again, not talking about looking at myself here ;) ). 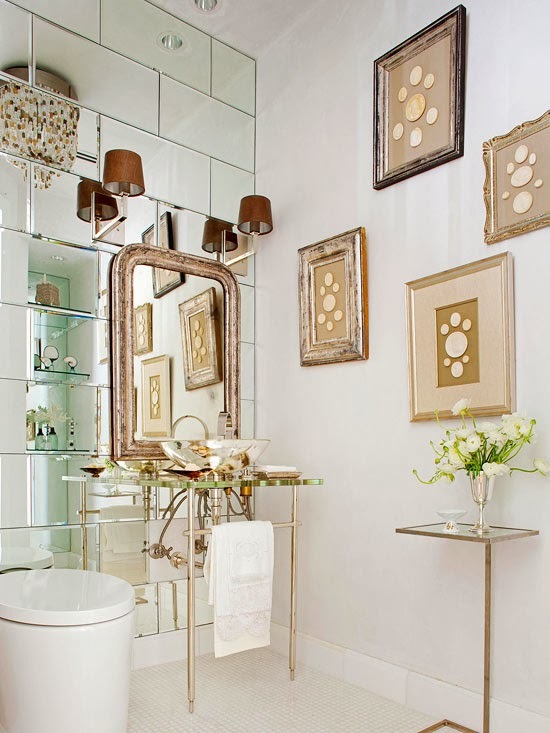 My favorite looks are when floor to ceiling mirrors are paired with gorgeous veined marble or creamy travertine. 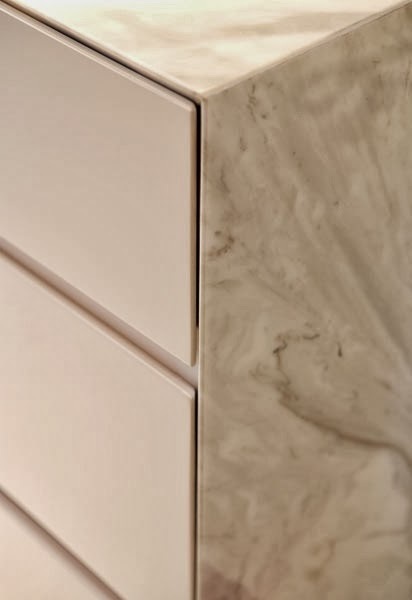 It's also nice if a few textured elements are brought in to juxtapose all the smooth surfaces. A large rock of fools gold, a giant shell placed near the mirrors or large palm leaf plants would all look fantastic and give a nice textured detail. Oh and don't forget some spectacular lighting, an incredible crystal chandelier will look twice as good! 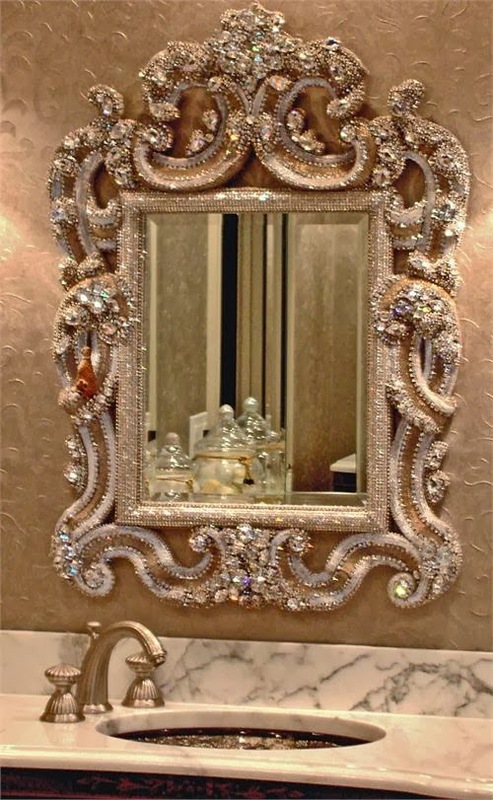 Now what about the style of the mirror? 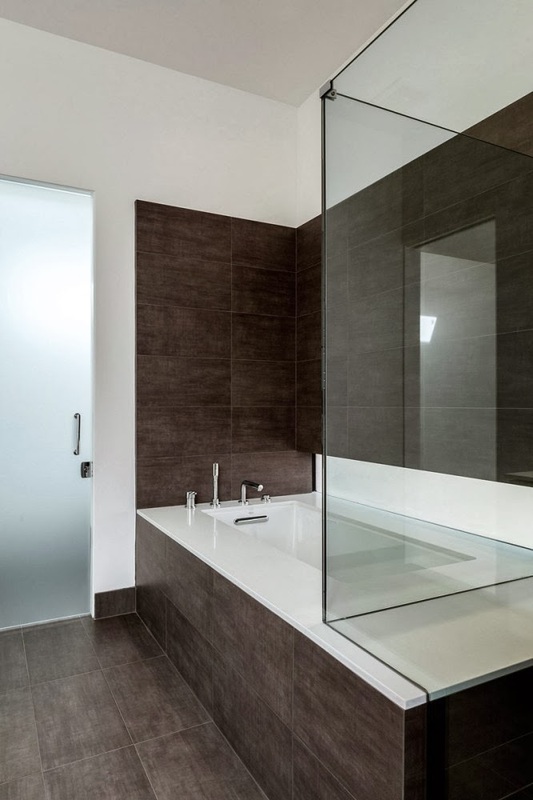 From one gigantic clear mirror, antiqued, to square panels, rectangular panels, beveled edges, tinted mirror, smoky, colored mirrors, there are so many options. 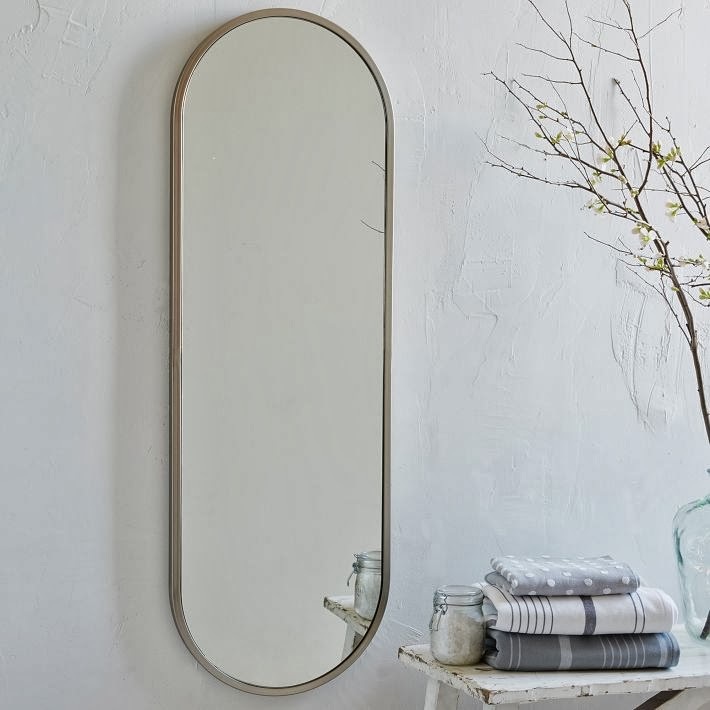 I love a clean modern look, so standard mirror is what I'd go with, either one solid piece or made up of panels. I do love the look of the antique mirror in the first photo. 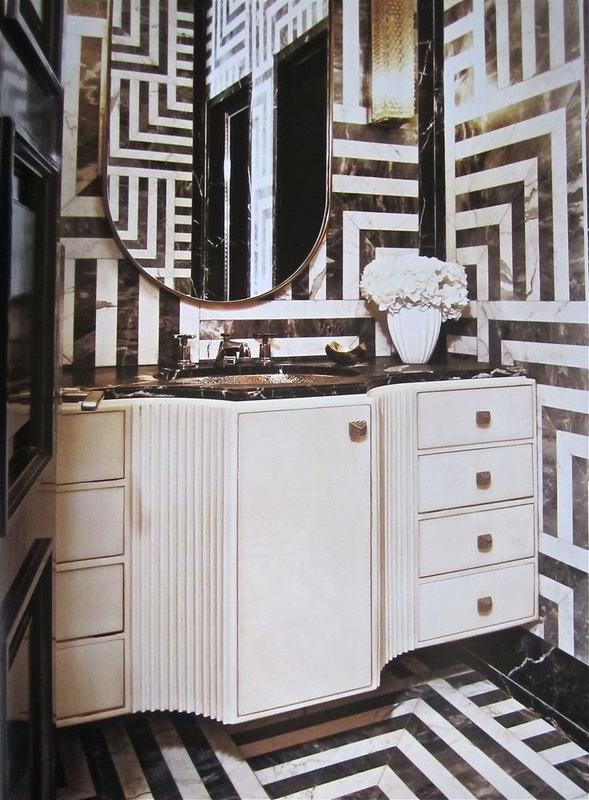 The only think I'd change is I'd have had mirror put behind the washstand as well. 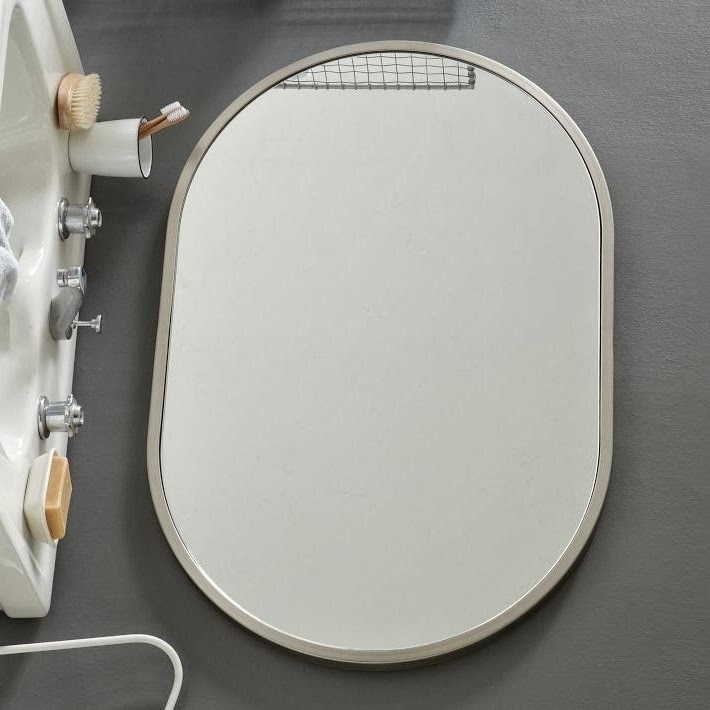 What is really nice about that antiqued mirror is, as per the website, the outer panels are antiqued to a medium effect, leaving the inner panels clear to be used as a normal mirror." 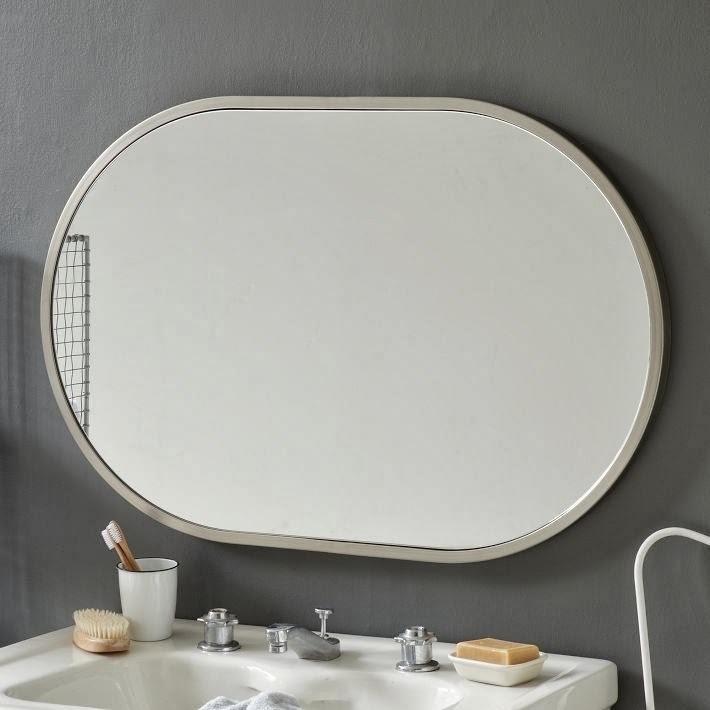 Nothing is worse then you have a gorgeous wall of mirrors in the bathroom, but you can't see yourself properly to check if you have anything stuck between your teeth!